On Friday last week our Phil & Ted’s buggy collapsed and died. It had served us valiantly, as well as it’s owners before us, but the great weight of The Little Mister and my niece combined was too much for it’s poor cracked frame. Unfortunately it died just after I had walked across the road from the car, with The Little Mister asleep and fully laden with beach stuff. I had to summon two youths who were standing nearby and they helpfully carried it back across the road to the car. So, this left us without a buggy and a camping trip planned in three weeks. Emergency shopping was required so we went to our local store which had a dreadful selection. 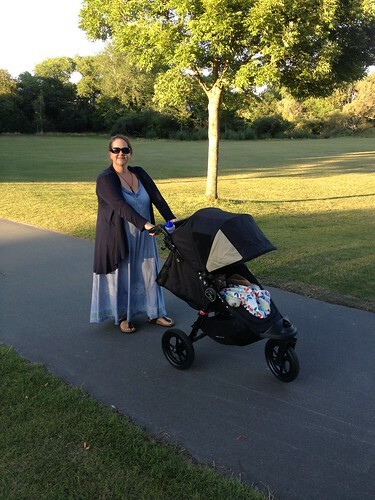 After many hours of reviewing our options we decided on the Baby Jogger City Elite. It was a bit like our old one (without the doubles kit) but quite a bit cheaper. I hate poor customer service and often complain, but this time I have nothing but good things to say about Practical Pushchairs. We ordered on Saturday night, I got an email at 7am on Sunday morning about VAT and the buggy arrived this morning. We were able to track the delivery all the way through. That’s pretty impressive service in my book! So, tonight a little walk in the evening sunshine. The Little Mister slept beautifully until we turned into the garden and now it is 9.30pm and he is still awake. I realised tonight that I didn’t have a picture of the day! 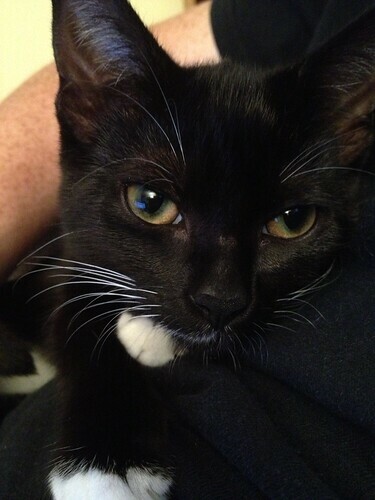 So, here is an emergency cat photo! Lottie and Mabel are settling in nicely to their new home. The only downside is that because they haven;t yet been spayed we have had to keep them in. It has been absolutely boiling so we have ‘kitten-proofed- the top windows with netting and Duck tape! They are mental but very gentle cats and The Little Mister loves them and seems to find them very entertaining. My garden is starting to fruit! I was watering my tomato plants when I saw this little beauty shining through the leaves! It didn’t last for long because I ate it and as I did I was reminded of my paternal Grandpa who was a tomato grower. In fact, both of my Grandpas grew tomatoes but my Dad’s Dad had a big glasshouse and I have such clear memories of spending time in the greenhouse. 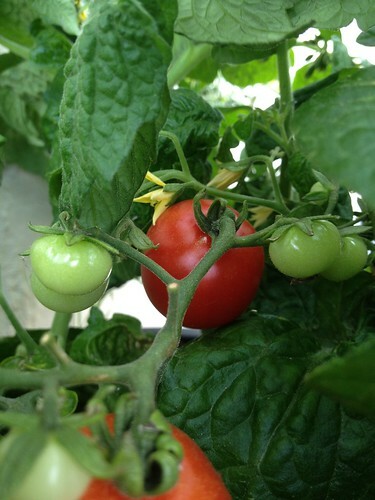 Just the waft of the tomato plants transports me back to being a little girl and picking the over-ripe little tomatoes off the plants and eating them. In supermarkets I have to sniff the packets of tomatoes to check they smell right and if they smell of nothing I won’t buy them! Today The Mister and I went to do a car boot sale. We were doing quite well until the heavens opened and we had to pack up. 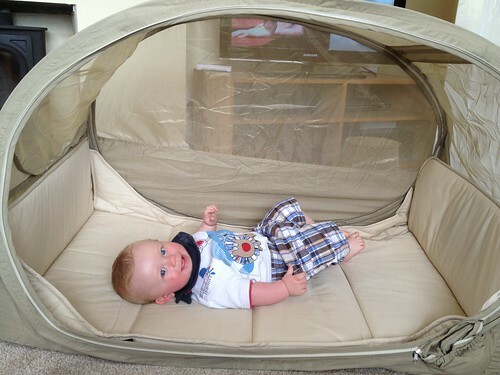 We did manage to sell more than I spent but I did buy this travel cot. We had been given one for camping by some friends but this one seemed a lot more spacious. The Little Mister seemed quite happy in it, as did the kittens!!! Today I was singing at a choir wedding. It had been warm and muggy all day but as we left the heavens opened. Unfortunately for the bride and groom they were travelling to the reception in a horse and cart! 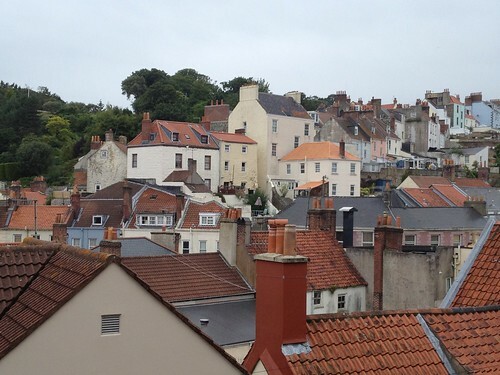 This is the view from by the church, over the rooftops of St Peter Port. I love skylines like this, they always make me think of Mary Poppins! Today The Little Mister and I spent a lovely afternoon on the beach with the ladies and babies. My Mum and my niece and nephew tagged along too which was nice. The babies were really funny, they are starting to develop their own personalities and becoming funnier each time we meet up. 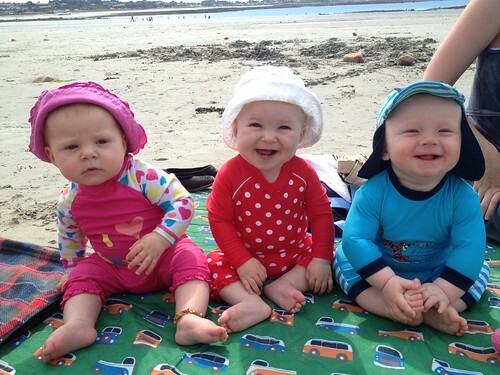 The weather was lovely today and the babies were all dressed in their sun suits. I was trying really hard to get them all to look at the camera. We managed that bit bit only The Little Mister and Clara were smiling, Amelia looks rather serious! Today my Mum couldn’t look after The Little Mister as she was busy so my sister stepped into the breach and looked after him all day. I like to think of it as a service to her to remind her why she doesn’t want another baby! Having said that apparently The Little Mister was really good all day, sleeping quite a bit and being entertained by his big cousins for the rest of the time, not to mention hoovering up all food that was pushed his way. This photo made me laugh. 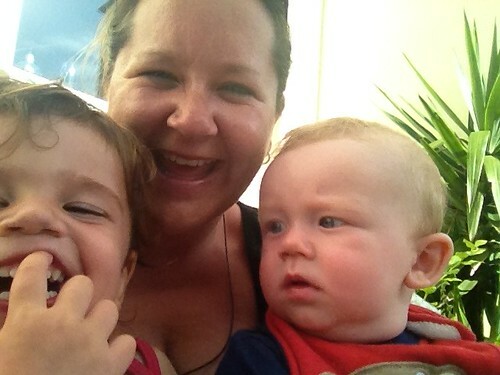 Eden looks like such a pickle and The Little Mister just looks so bemused! Today I had a meeting with a colleague so walked through one of our local parks, Candie Gardens to get there. 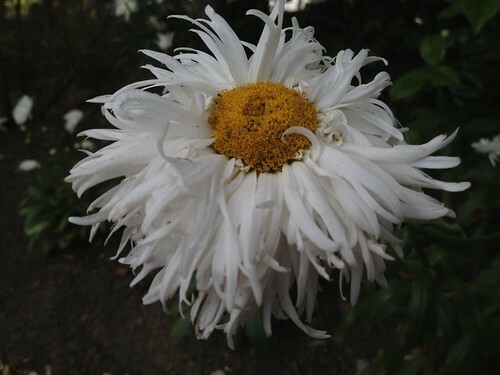 This beautiful fluffy daisy caught my eye. It was so delicate lovely and there was a whole bunch of them swaying in the wind. Lovely. 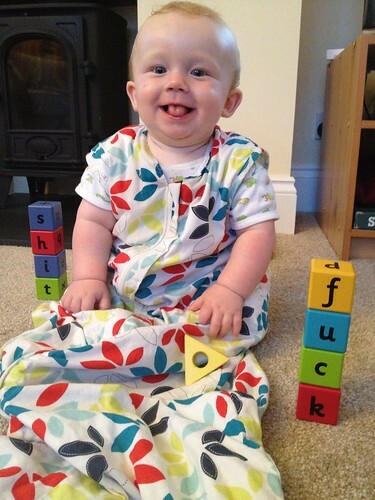 I went out to a choir rehearsal last night and when I got home The Little Mister was wide awake and he and his Daddy had been playing with the alphabet blocks. 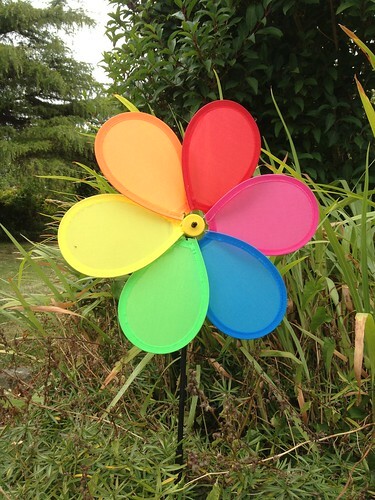 My mother-in-law bought The Little Mister this windmill a while ago. It is very busy at the moment because it is so windy but it is cheering up our garden.